Are you a realtor aspiring for a wider reach with your properties? 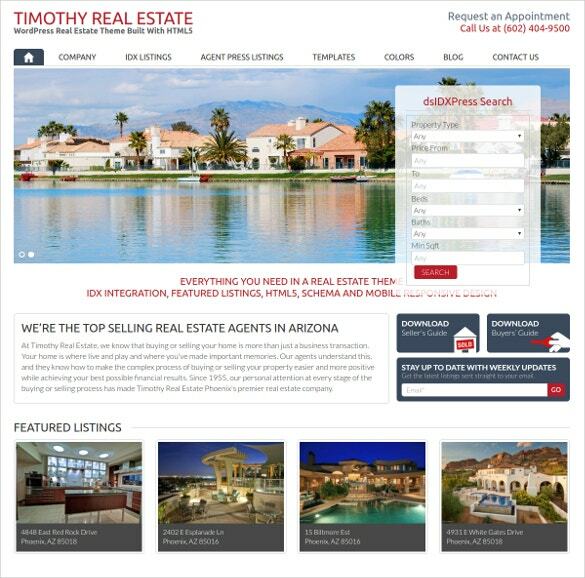 Well, that’s great but have you ever thought of having your own realtor website? You are definitely backed by a highly satisfied clientele who will recommend your name to their friends and relatives but do you know what happens after they get your referral- they will look online for you. 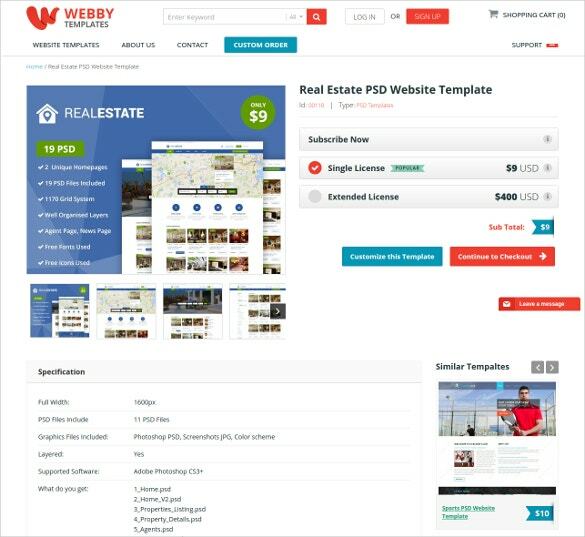 you May also See Real Estate PSD Templates. Everything is getting digital today and internet is the go-to resource for anything people want to know be it the local news or latest style statements or a real estate agency like that of yours. Now, in case those people can’t find you online, you can imagine how big you are going to miss out on your business! 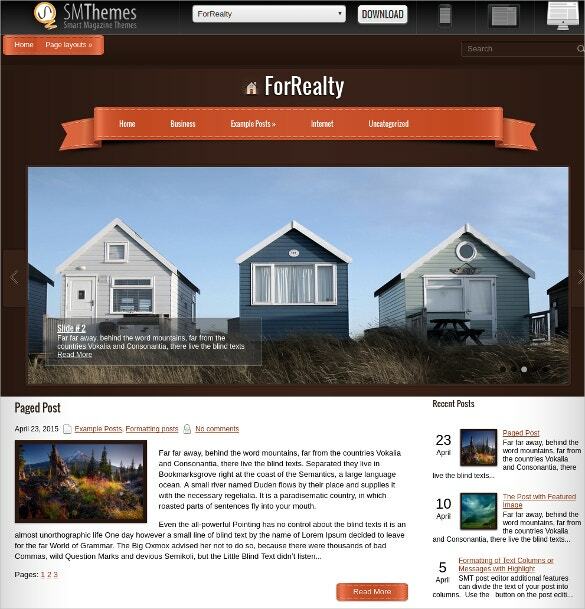 you May also See Real Estate WordPress Templates. Flexible rotator, widgeted home page, call to action boxes. Revolution slider, live previewer and 3 header layouts. SEO optimization support, Theme customizer and multiple demo options. Frontend listing management, WPML and RTL support. Five preset styles, unlimited color variations and contact form. 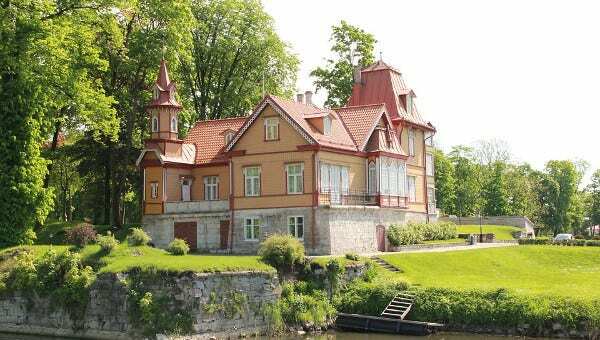 Hot photo gallery plugin, free mortgage calculator and PSD file. Cross browser compatibility, Free plugins and Flexible CSS option. Robut Admin panel, 2 column layout, and HTML plus JS animation. Experienced Support team,Life-time free usage of stock photos and images. Blogs, Forum and Portfolio options. 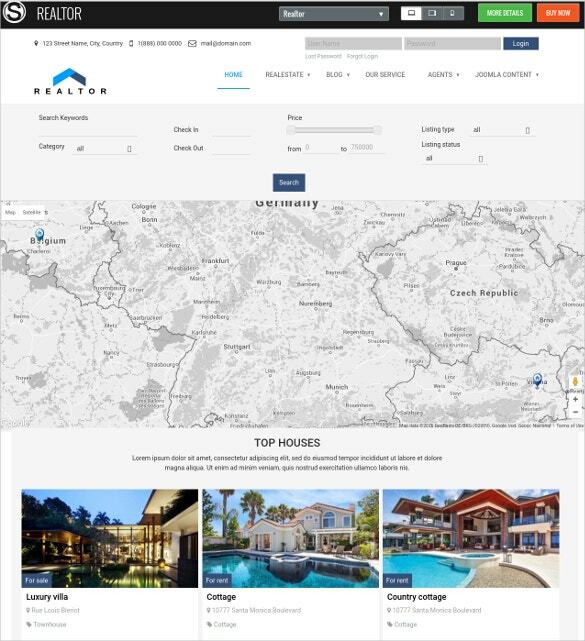 Sophisticated property search, over 100 shortcodes and 100% responsive design. User-friendly admin panel, custom widgets and Google maps support. 380+ Retina ready icons, unlimited colors and Property slider content. Cross browser compatibility, XHTML and CSS advantages and 5 ad types. Custom header, thumbnails, posts and menus. Special 404 page setting, RSS ready and Gravator ready. 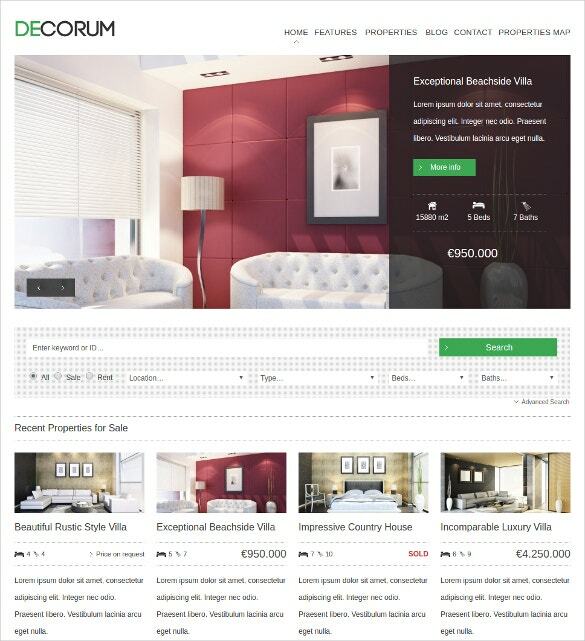 WooCommerce integration, Responsive design, ECwid support and numerous shortcodes. Custom Sidebars, Widgets and menus. Dynamic content loader, Google maps and Social share bar. Presets builder, HTML Plus JS and Parallax animation. Google web master tools, Iframe and Google web fonts. 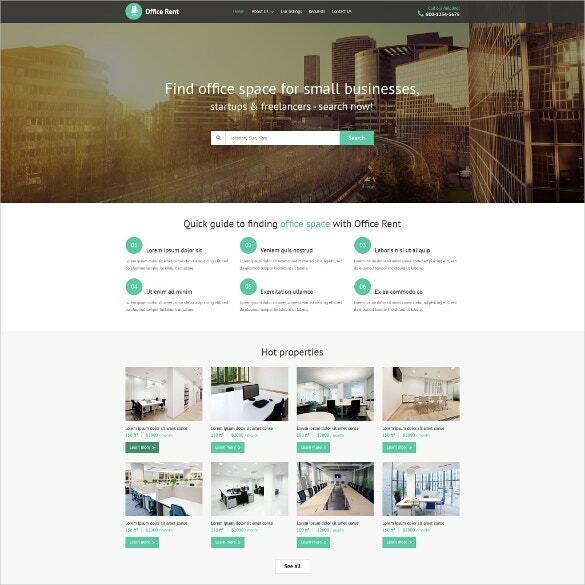 Flexible layout, video integration and Well documentation. Robust page builder, Unlimited colors and background options. Front End Submission system, Retina Ready icons and translation support. Shortcode generator, Numerous Google fonts and SEO optimization codes. 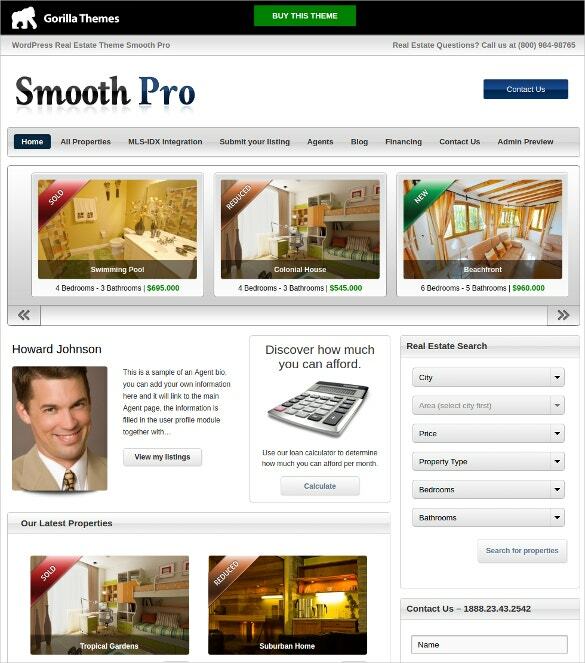 Advanced property slider, unlimited skin variations and numerous page templates. More than 30 Google fonts, custom logo and menu. Easy installation, Dedicated support team and custom posts. 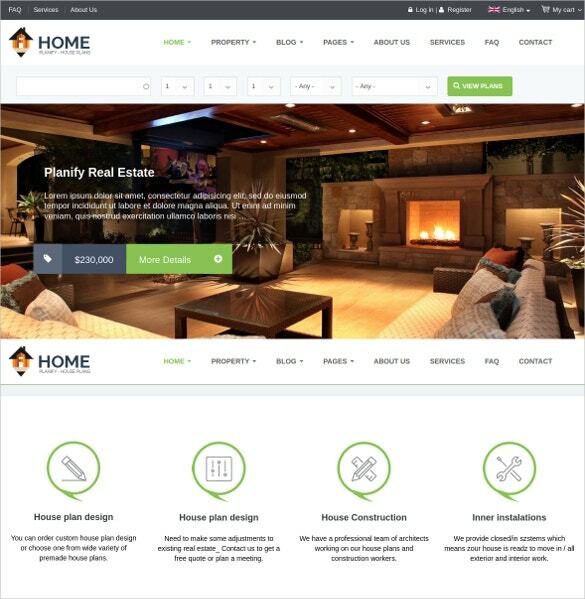 100% Responsive design, advanced property search and over 100 shortcodes. Default and grid listing options, user-friendly admin panel and custom widgets. 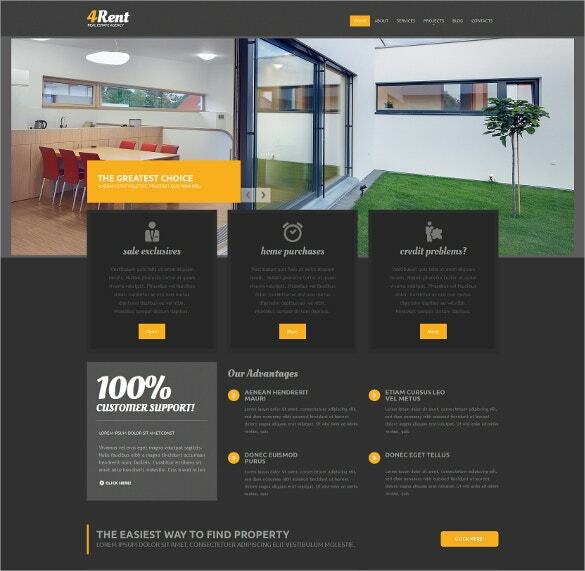 Property slider content, over 600 fonts and retina ready icons. Fully Responsive design, Geo location and Google maps options. Custom search fields, easy installation and SEO optimization support. Retina Ready icons, Images, video and document upload support. SMT framework 2.0, WooCommerce integration and Ecwid support. Dynamic content loader, Google maps and Slider options. Custom widgets, menus and sidebars. Translation support, contacts page and Social share bar. Parallax effect, 42 stylish animations and color picker option. Custom widgets, Grid gallery and advanced SEO options. 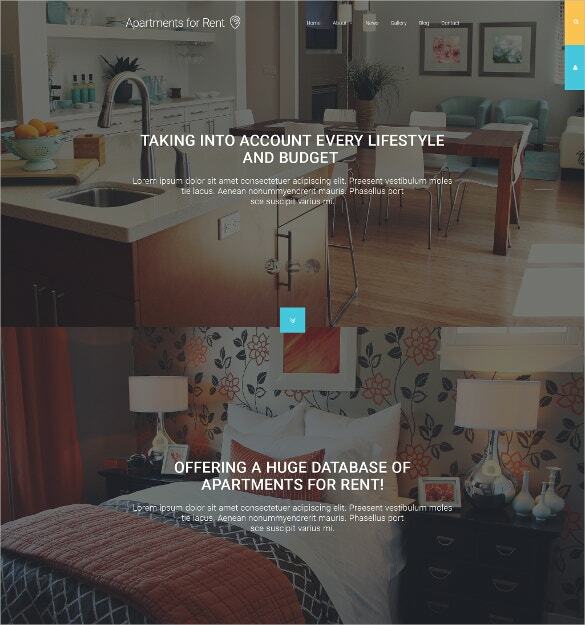 Mobile- ready responsive design, properties search and Google maps integration. MLS listings, unlimited color variations and Google fonts. Visual composer, Layer slider and custom shortcodes. Collapsible modules, 8 preset colors styles, and over 40 Google fonts. AS art slider, Logo and side bar configuration parameters. User friendly operations, advanced search options and robust admin panel. Unlimited colors, multiple page templates, and default and grid listing options. 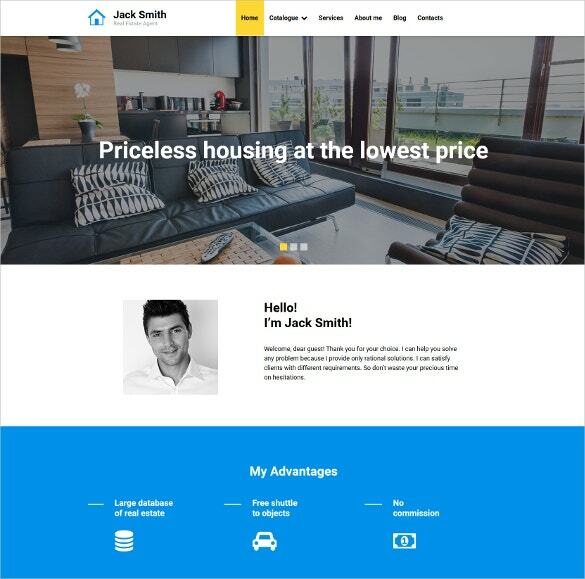 Twitter Bootstrap framework, HTML template and responsive design. 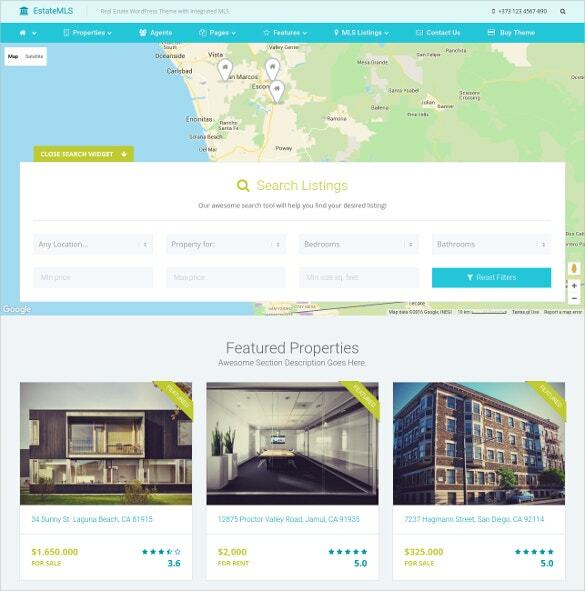 Cross browser compatibility, Agent’s welcome area, and property showcase slider. Resources section, contact form and SEO Optmization support. Novel mapping widget, Customizable maps, and unique text styles. 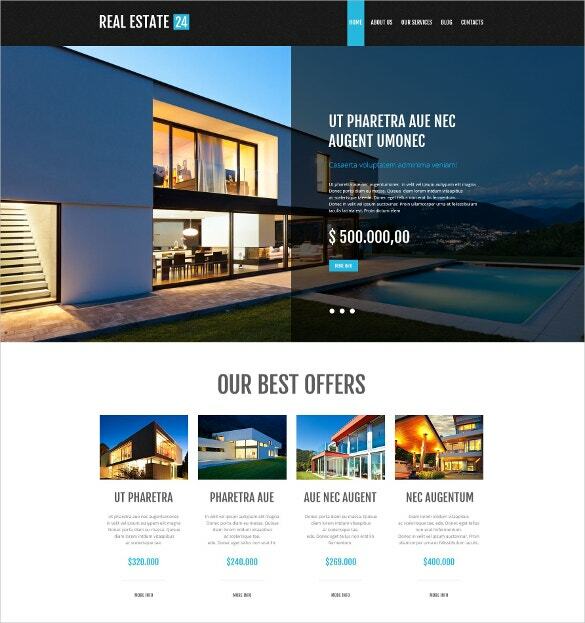 Completely Responsive design, Retina ready templates, and Parallax effect. 24/7 Free support, High resolution picture gallery, and Megamenu navigation. Full-width images, Huge sliders, and 1170 Grid system. Advanced search option, Retina ready icons and Theme options. Google maps integration, shortcodes and widgets ready. Royal Slider, free updates and extensive documentation. 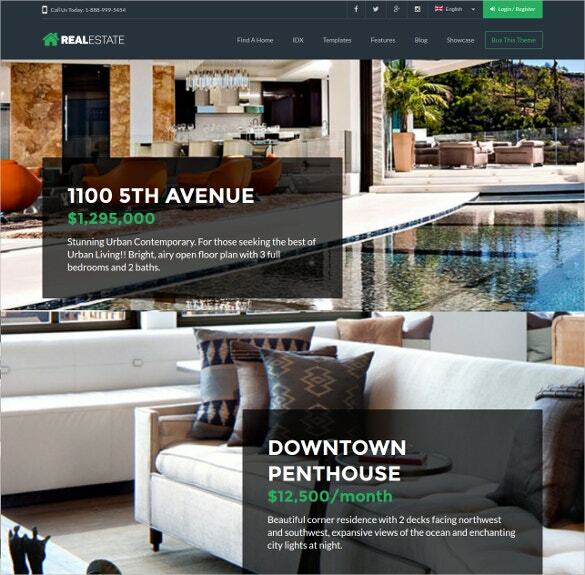 Real Estate Manager software, and K2 components. Touch Slider, custom codes and numerous Google fonts. HTML 5, Module search, and Free support. Lazy load effect, Parallax effect and Dropdown menu. Google map, Favicon and Google web fonts. Theme color switcher, On-line chat and cross browser compatibility. 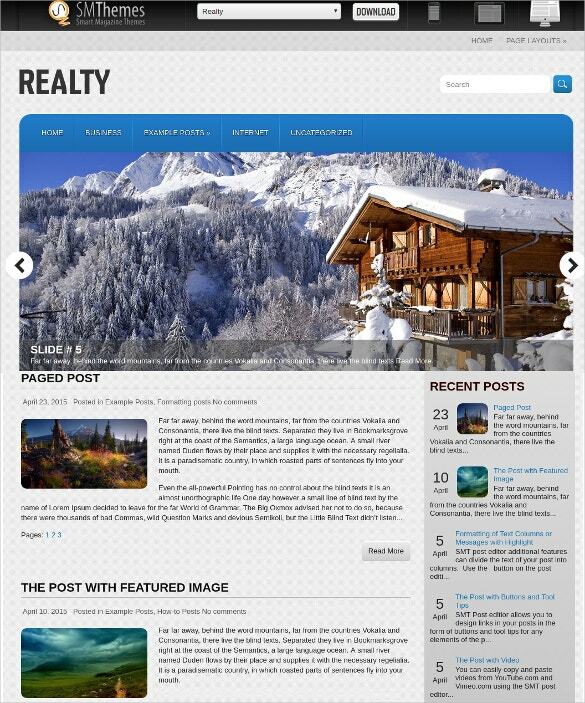 WordPress IDX- MLS Real Estate Integration, currency-metric selector and Retina ready icons. 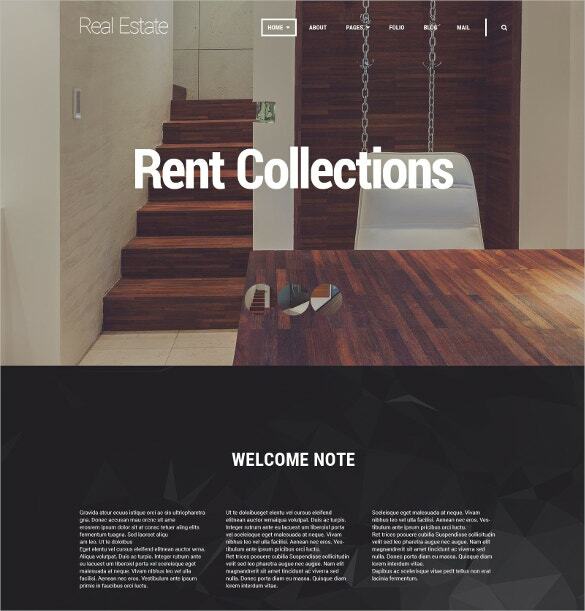 Real estate widgets, 5 preset color styles and attractive property galleries. 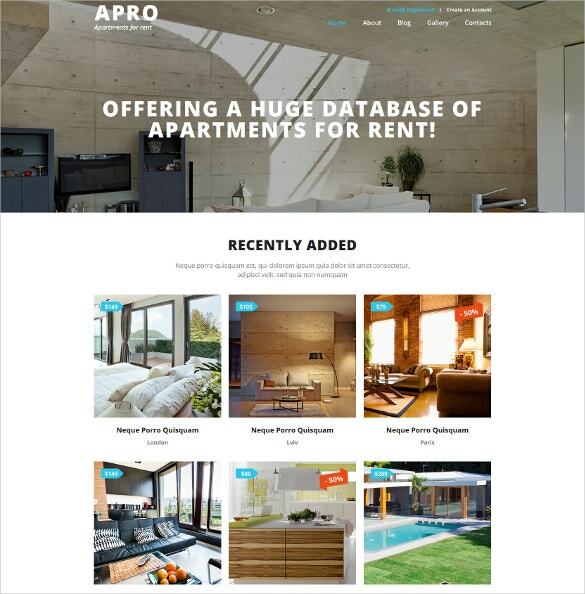 Google maps, property slideshow and advanced property search. 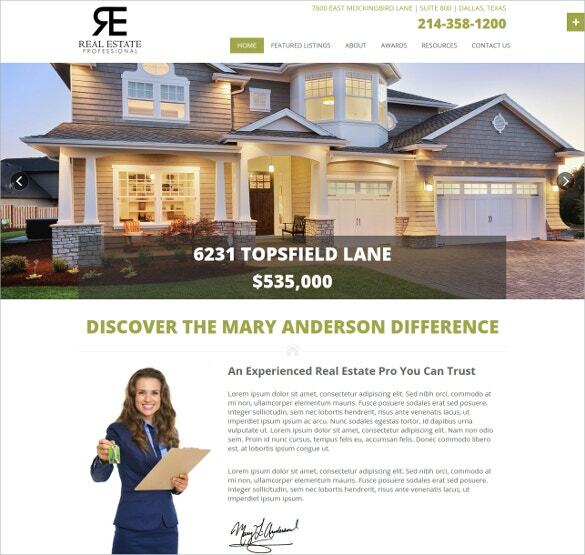 So, it’s the most needed for you to have your own realtor website to ensure easier access for your potential target audience- and this includes beyond the handful of those who come to you based on referrals. 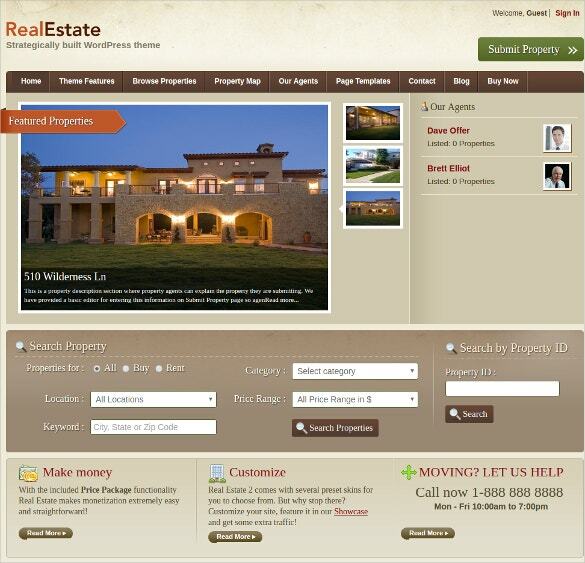 It has got even easier to have your real estate agency website and the credit goes to Realtor Website Templates. 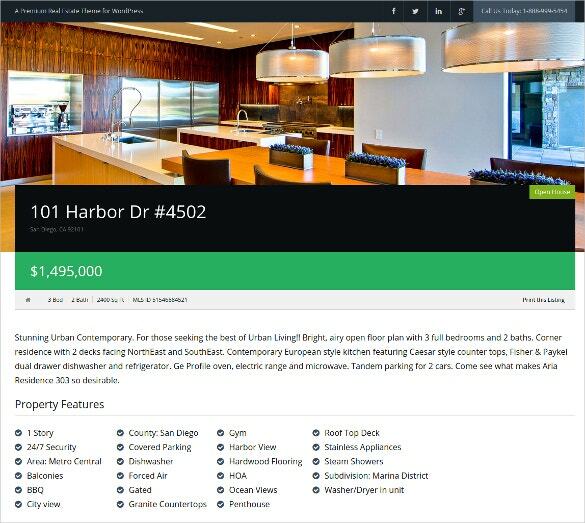 Your website makes property search extremely convenient for your visitors as well. 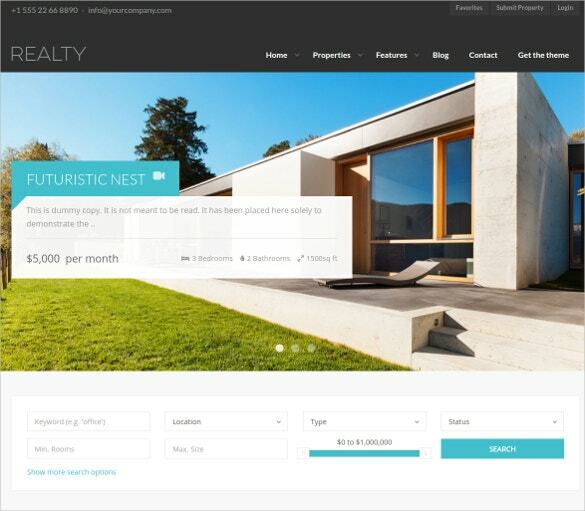 You can even include the different updates such as the latest listings or the ongoing hot deals on your properties in your website so that your visitors can have a complete knowledge of the latest offers from your property- without you having to visit them physically. 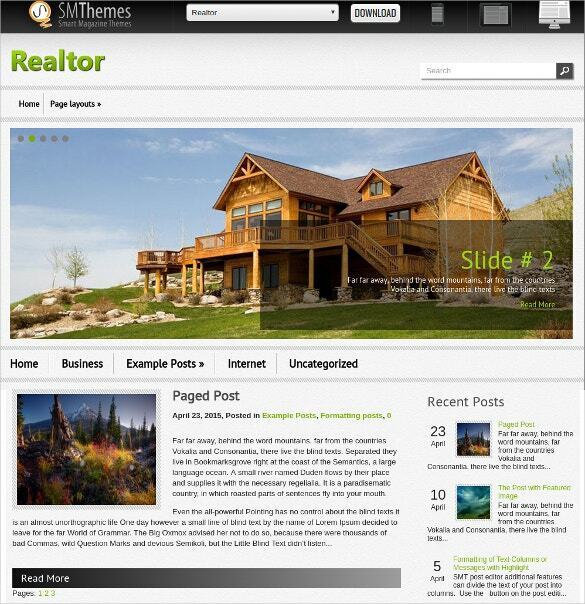 You May also See Real Estate Blog Templates. Besides, you can use your website to elaborate about your company’s mission, vision and why you stand out above your competitors. 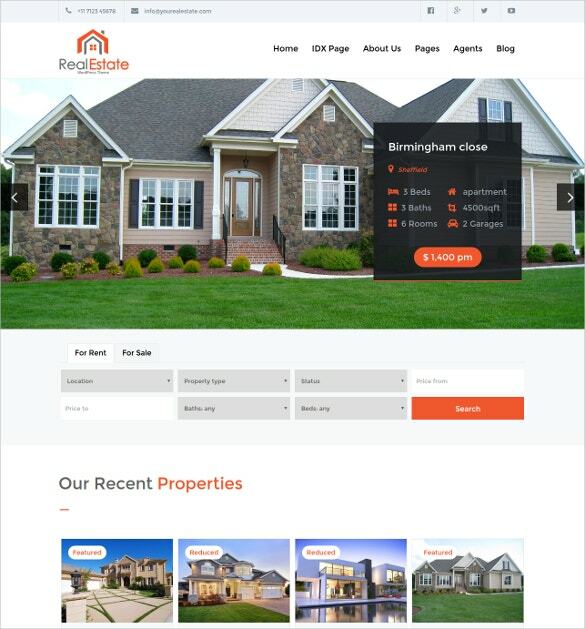 Your visitors would always want to know how your other clients felt while working with you and with your real estate website agency template, you can show them the rave testimonials you have received from previous clients.You May also See Real Estate Bootstrap Templates. 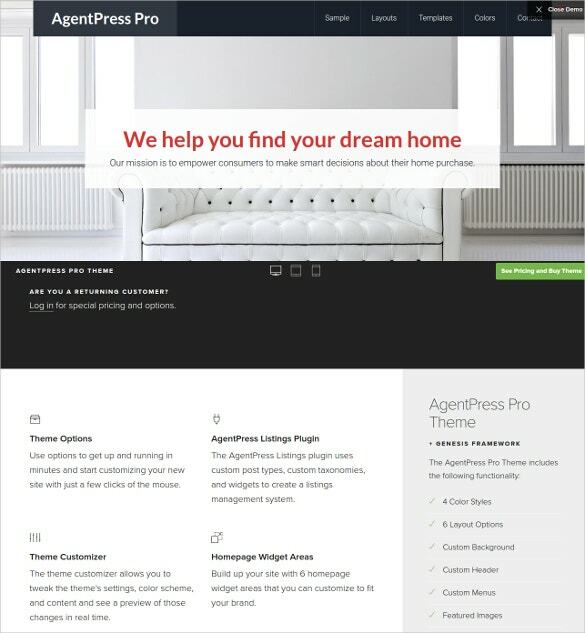 It’s always a good decision to go for realtor WordPress website templates while you are planning for your realtor website. 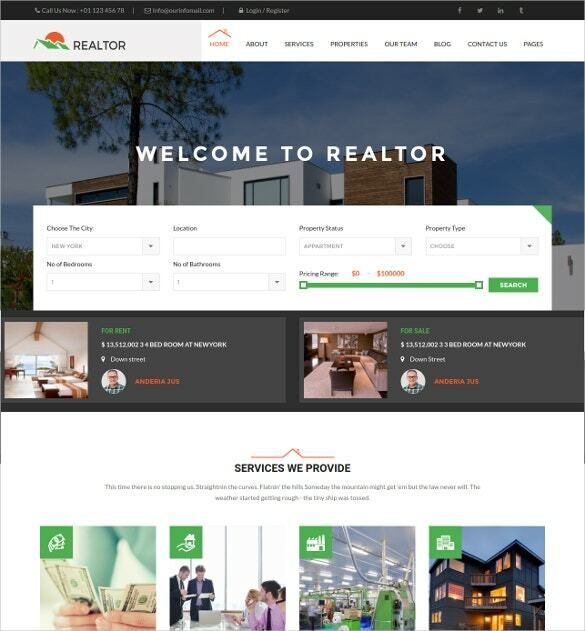 Actually, the templates come up with readymade website template frameworks for realtor website so that you don’t need to do anything from scratch. 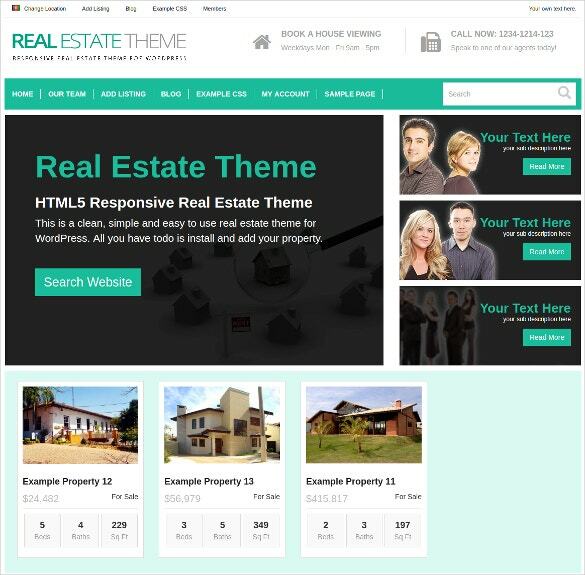 You May also See Real Estate HTML5 Templates. In some of the cases, you will find them free of cost. 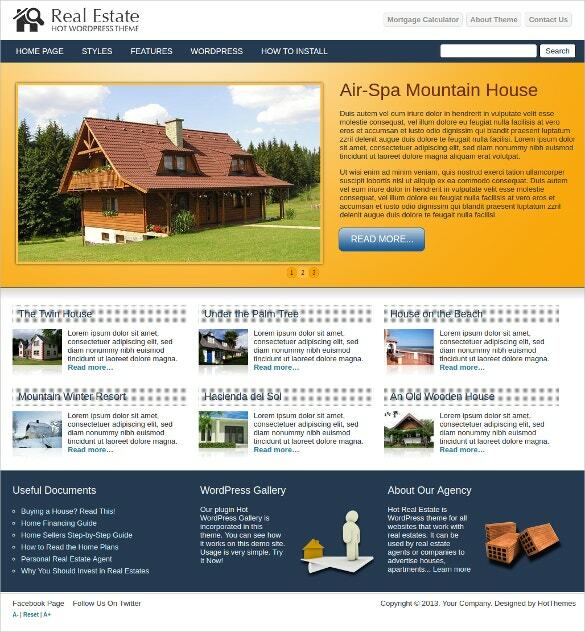 Thus, you are saved from hiring an expensive web developer for creating your website. 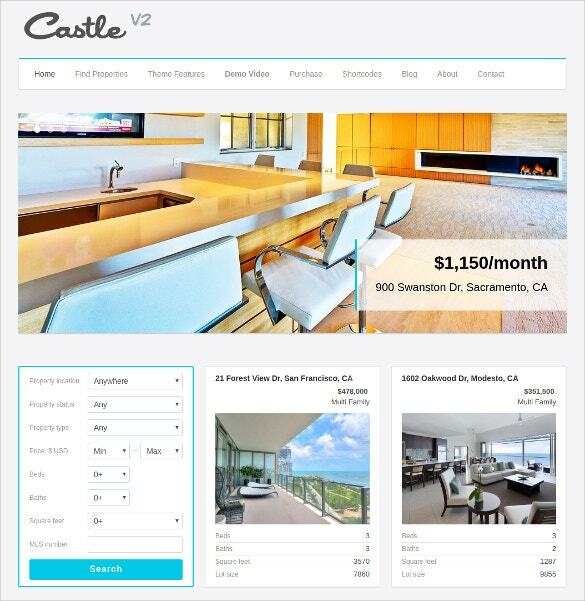 Even if the premium Real Estate Website Templates are paid, they will cost less than hiring a developer. Moreover, these templates can be customized easily. 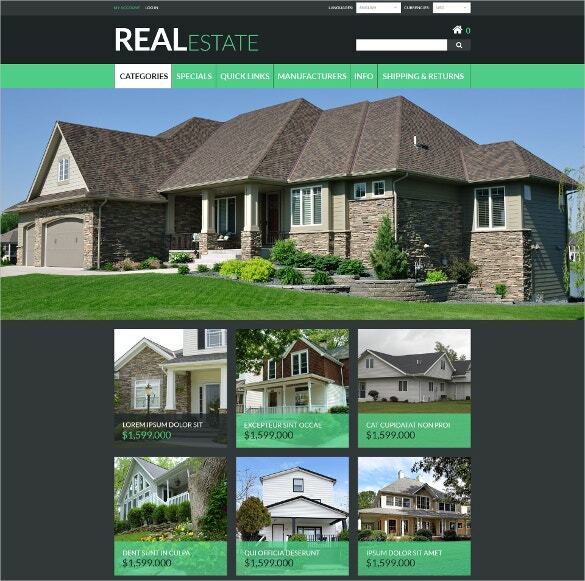 You will also find responsive realtor website templates that fit seamlessly even for small screened devices. 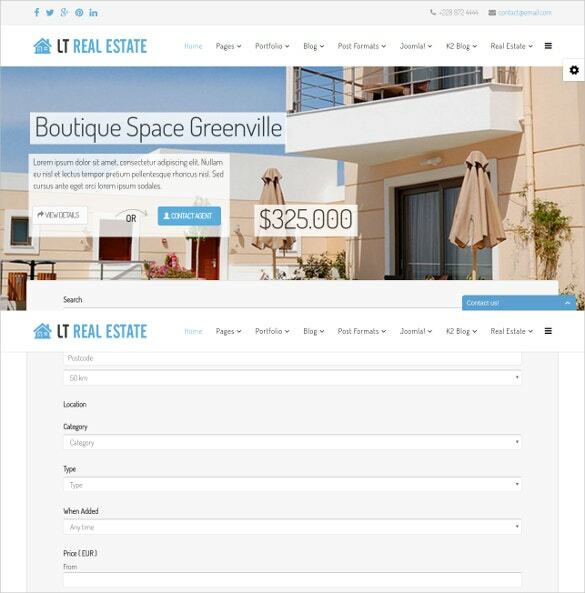 You May also See Real Estate Drupal Templates. 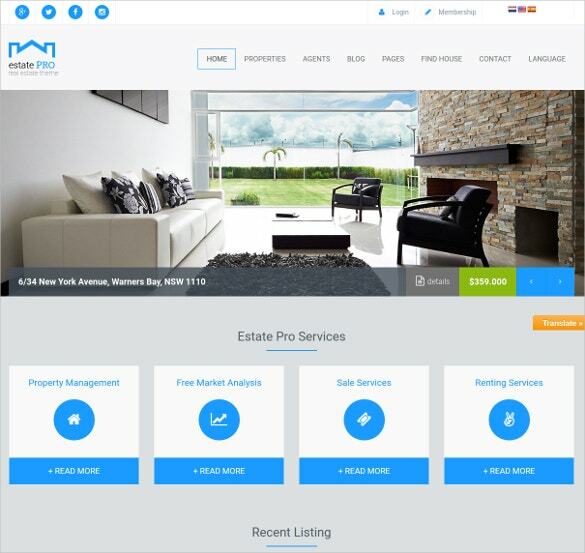 If you are in search of the best realtor website templates, you can anyday come to template.net as it assures some of the most top notch website templates for realtors with best features. 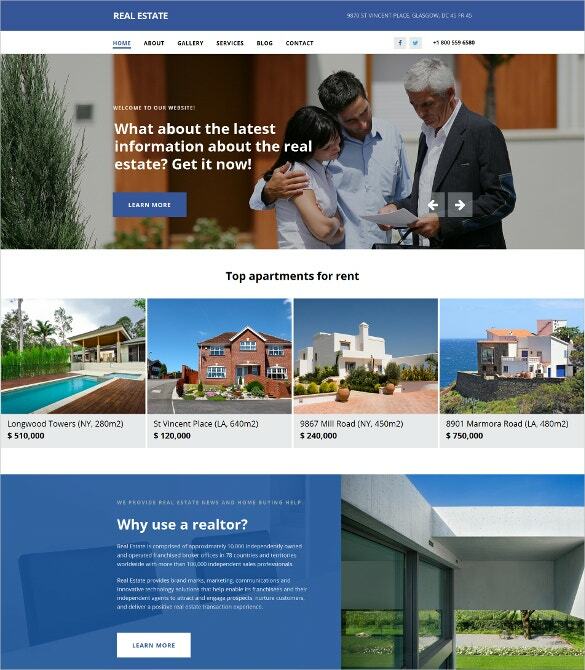 You May also See Real Estate Magento Templates.